When the Emirates Golf Club was established in 1988, it was the first all-grass championship course in the Gulf region, and was dubbed ‘the desert miracle'. 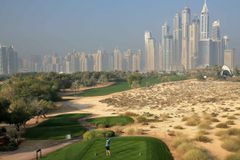 Since then, the Emirates has been at the forefront as Dubai has flourished as a golf destination, and is home to two outstanding championship courses and a 9 hole par 3 course. The Majlis Course is the headline act, boasting breathtaking views of the Dubai skyline. This epic course hosts one of the most prestigious events on the European Tour; the Omega Dubai Desert Classic. The event attracts some of the biggest names in golf, having been won by Tiger, McIlroy, and Seve, with our own Chief Holiday Officer, Lee Westwood, being a regular contender. We found 16 offers matching your search. The Majlis is the Emirates' original layout, but it remains one of the most challenging in the region, and hosts the world's best professionals for the Dubai Desert Classic every year. The idyllic holes created by designer Karl Litten are carved into the great swathes of sandy wasteland, and combine to produce a 7,185 yard championship course of the finest standard and the most dramatic character. Stephen Gallacher produced a tremendous back-nine fightback to become the first player to successfully defend the Omega Dubai Desert Classic. The 39-year-old Scot finished at 16-under par, one clear of Argentina’s Emiliano Grillo, with Romain Wattel and Brooks Koepka a further shot back in joint third. After firing an opening round 63, Rory McIlroy’s closing 74 saw him finish four behind Gallacher in tied ninth, while Tiger Woods finished at six-under (T41). Since Nick Faldo completed his comprehensive refurbishment, the Faldo course has deservedly stood side by side with the more prestigious Majlis layout. Now stretched to a wearying 7,328 yards, the Faldo challenges both ball striking and creativity. The putting surfaces are extremely challenging, while the ever-present expanses of water can quickly upend your scorecard. Always in terrific condition, the Faldo is now well worth playing during your trip to the awesome Emirates Club. The impressive clubhouse at the Emirates is designed to resemble a Bedouin tented village, and is a reminder of the region's humble origins. The spectacular 8th hole is a real favourite amongst many of the pros. In fact, so much so that Justin Rose considers it to be in his top 9 holes in the world. At stroke index 3, the hole is challenging and plays long due to its dogleg right and uphill fairway. From the tee, the golfer is greeted with the magnificent view of skyscrapers ahead, and these can be used as a reference to the line of the tee shot. The green is both small and fairly undulating, and combined with a long yardage, this makes for a tough approach shot. A great hole, with little margin for error and requiring a solid drive to allow yourself to make the green in regulation! Our tee time was brought forward so we played in daylight for the first 9 and floodlight second 9 - not ideal in the dusk! The French restaurant was busy and over priced for what amounted to a bistro style meal and on departure we were ushered into a private car by ground staff which was twice the price of a normal taxi- sharp practice suspected! Super Course. Drinks are expensive even by Dubai standards though!